So, your girlfriends or co-workers have surprised you with a baby shower. But, what are you going to do so that your relatives don’t feel left out of the ‘new baby’ excitement? Or maybe your baby decided to arrive ahead of the baby shower that was planned. How can you arrange for your loved ones to meet the new bundle of joy, and still having a sort of ‘baby welcome’ party. Naming ceremonies are an ancient African tradition that have long been forgotten by many people of African descent, but they still serve a purpose today. The naming ceremony is one of the many rites of passage and initiation that we should guide our children through as we prepare them to be the adults that will take leadership in the world tomorrow. The Baby Naming Ceremony is a celebration that allows the parents to present the new baby to friends, relatives and the community, and allows for the child’s name to be announced, the meaning explained and for the ‘village’ of loved ones to welcome the little one with gifts and blessings. The timing and structure of the event has always varied from culture to culture, but the naming of a child is very significant in all African cultures. Since the name a person is intrinsically tied to their identity (character and purpose), within African societies, the name chosen is key to the child’s success in life. If you do some searching and talk with friends or family members from the mother continent, you will get a wide variety of formats and rituals that are associated with a baby’s naming ceremony. As such, the specifics of the event can vary from family to family and even, from child to child. However, there are some rituals that seem to be common to most, if not all African cultures. The Eight Bowls of Life Lessons is one such ritual and while the elements may vary, it is an essential part of the birth rite of passage. Wine – The appreciation of tradition and heritage. Honey – The appreciation of the sweetness and joys of life. Lime – The ability to overcome hurt and betrayal. Salt – The ability to practice wisdom and balance in decision-making. Cayenne Pepper – The resilience to rebound in the face of crisis. Water – The fluidity to embrace life’s constant changes. Palm Oil – The reliance on one’s community for power. Coconut Meat – The reliance on the Divine for unearned blessings. Usually, a family or community elder officiates the ritual and introduces each element to the gathering. 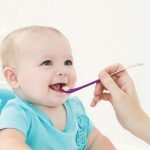 While explaining the symbolic meanings of each element and declaring the life lesson that it represents, the officiant puts each element to the baby’s mouth to be tasted. Then each bowl is passed for the items to be tasted by the parents and all the participants. Then the officiant expresses prayers for the child’s well being and good character to complete this aspect of the ceremony. Acknowledge the family history and remember the ancestors. Affirm who the new family is and what they are about. Aspire to see the new baby fulfill specific hopes and dreams. So, a naming ceremony must be distinguished from a christening, infant baptism or dedication – which are usually part of a main church service. A traditional African naming ceremony is often kept outdoors, to facilitate the child experiencing and being welcomed by the elements of nature. You could picture the warm morning sunshine kisses your little one’s skin and cool breezes tickle her bright eyes, while her tiny feet are being placed in the dirt and and grass. But, it may also be hosted in a variety of locations. So, if an outdoor venue is not feasible, it may be hosted in your home, a reception hall or even a restaurant. Libation: Select a special reading that (a) acknowledges the role of your baby’s living elders, (b) honours the contributions of your baby’s deceased ancestors, while (c) gives thanks to the Creator for the new life of your child. Introduction: You can share the story of how your child came into this world, and include details that are memorable and significant to both parents. Presentation: Announce your baby’s name, along with the meaning and the reason for the name chosen. Declaration: State what you believe to be your child’s purpose, or share the dreams and aspirations that you hold for your little one. Then make public your commitment to ensure that your child lives according to his/her purpose. Initiation: Conduct a symbolic and meaningful ritual, to welcome your new baby into your family and community, like the traditional Eight Bowls of Life Lessons. Selection: Identify the persons that you have chosen to be mentors or second parents for your child and, share the values that you want the ‘village’ to encourage in your child. Then have the committed persons make public their commitments to ensure that your child is raised according to these values. Celebration: Invite everyone to offer their gifts, blessings, promises of support, and words of wisdom. Then the formalities of the ceremony are usually followed by a party with lots of food, music, games, singing, dancing and just a lot of happiness. Whether you are trying to have a gathering for loved ones who got left out of the pre-birth festivities, or you’re looking for an alternative to a baby shower, a baby naming ceremony is a beautiful and significant family tradition to begin. The most beautiful thing about the naming ceremony is that it is not time-sensitive. So, if you have an older child, a naming ceremony would be an memorable way to celebrate their next birthday or another important milestone in their life.